Northern cities were a popular destination for African Americans who had left the Jim Crow South searching for fairness and opportunity. For instance, in the city of Detroit, from 1910 to 1930, the black population grew from under 6,000 or about 1% of the population to 120,000 or 9% of the population. At this time, the FHLBB asked HOLC to create "residential security maps" to secure the real estate market. 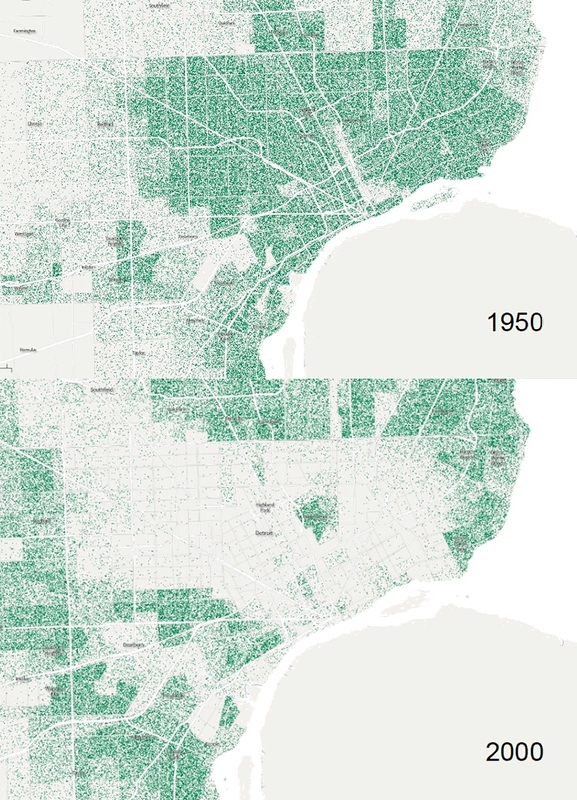 By 1970 Detroit had over 660,000 black residents, comprising about 45% of the population. Numbers continued to increase until by 2010 the city had over 710,000 black residents totaling over 82% of the population. Due to white flight, the population didn't raise as significantly as the percentage. To the right are demographic maps of Detroit from 1950 & 2000, each dot representing 10 black residents. The term ‘white flight’ was coined to describe the exodus of white people from neighborhoods experiencing racial integration. As urban areas became increasingly racially mixed, white city-dwellers moved out to the suburbs. This trend was facilitated by an increase in wages and the issuing of federally guaranteed mortgages exclusively to white people. The homogeneity of the white suburbs was preserved by discriminatory practices such as 'redlining' and the refusal to grant home loans to non-whites. The only option for minorities was to move into the city-centre residences left vacant by the departing white people. To the right is the white demographic shift from Detroit to the surrounding suburbs over 50 years, each dot representing 10 white residents.